joy magnetism: Where have all the flowers gone? A friend of mine from Atlanta sent me this superpretty magnet. What? I just did four straight posts on pretty boys. Now here's some actual pretty! Chrysanthemums, to be exact. 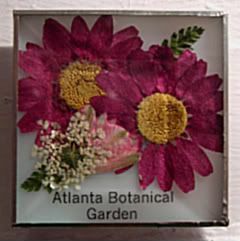 I've got a couple of these flower magnets, and on the back, they all say REAL FLOWERS (just in case you thought they weren't), and the name of the flowers pressed under the glass. Dudes, someone actually had to sit at a table and press the flowers. Did they grow the flowers just for this purpose? Is there a magnet flower farm somewhere? How do you choose which flowers to press? Are they seasonal? Do they freeze or shellac them, or something before they get set on the tiles? And like, when you're pressing flowers, are you constantly looking to see if one of the petals have pressed funky? I mean, I do that when I press flowers into a book. Does anyone do that nowadays? Press flowers into a book? How sentimental. And an odd thing to think about in this day and age. I've done it only a couple of times that I can remember. A pretty flower from somewhere in Big Sur. A pretty baby bloom from Paris or England, I can't remember. Oh, and somewhere, in a travel book, I have contraband pressed blades of grass from Heinz football field in Pittsburgh. What? Again. Having hit Publish Post and seeing this magnet in layout...how pretty with the blue and green. Sigh. Thanks for posting. Wow - you've made some beautiful items! And, I love that you're from NC - I totally grew up in Salisbury, NC.